Make 4 payments of $3.34 over 8 weeks and get it now! All puppies are born with intestinal (gut) worms, and older dogs can pick them up at the park, so it’s important to treat them regularly to prevent sickness or worse, fatal intestinal blockage. To check if your pup has worms, look for a fat, round, belly; thin coat, and less playful behaviour. It’s a good idea to give your dog worm treatments at two, four, six, eight, 10 and 12 weeks of age. Although roundworms are the most common worm in puppies, you can also give a broad-spectrum treatment, which also treats hookworms, whipworms and tapeworms. For the treatment of all common intestinal worms including Roundworm, Hookworm, Whipworm, Tapeworm and Hydatid Tapeworm. Please note - These tablets are for intestial worms and do not treat or control heartworm. To ensure effective worm control, treat all dogs in the household at the same time. Animals infested with worms are a continual source of reinfestation to other dogs. Signs of worm infestation in dogs are lack of energy, loss of weight, vomiting and diarrhoea. An important part of the worming program is flea control. Dogs are frequently infested by tapeworm (Dipylidium caninum) which uses the flea as a carrier. Older puppies and adult dogs should be given this remedy every three months, or monthly, depending on what the product tells you! Do not use in puppies under 2 weeks of age. This medication should not be used in animals who may have allergies to any of its ingredients. 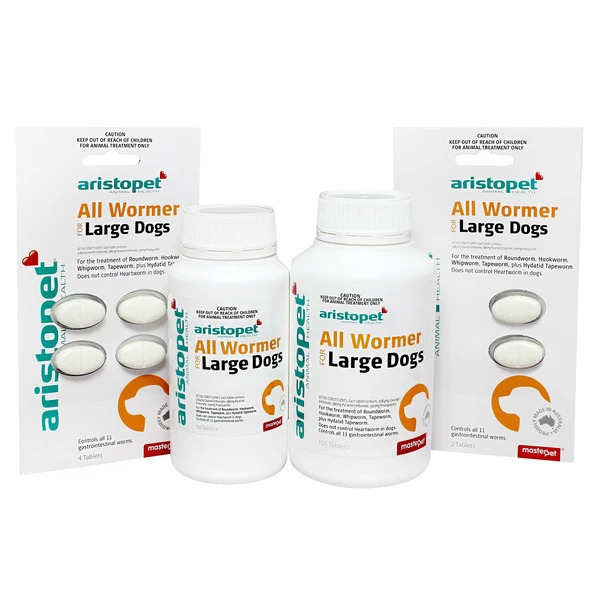 The side effects of Aristopet All Wormers are rare at the recommended dosage. It has a wide margin of safety for all sizes and breeds of dogs. It is approved for use in puppies as young as 2 weeks, old animals, greyhounds, working dogs, pregnant females, breeding dogs and stud dogs. It may be combined with other treatments, for example heartworm prevention, flea and tick treatments and vaccination. Please weigh your dogs before treatment to avoid overdosing. Write down the date, the dog's name and weight on the Worm Control Chart on the sleeve of the package, to keep an accurate record of treatment. Your dogs are treated by weight with the appropriate sized tablet or combination of tablets. Aristopet Allwormer is given as a single dose by mouth. Fasting prior to dosing is not necessary. One 10kg tablet for puppies and dogs will treat a dog up to 10kg. Dogs over 10kg and other weights are given a combination of the tablets. Treat pregnant dogs at the time of mating, before whelping and every 3 months. Dosage: One tablet per 15kg-20kg bodyweight every three months (always refer to packaging for instructions). For Hydatid Tapeworm; Dogs should not be fed or allowed to feed on offal from any species. Dogs in hydatid areas should be treated every 6 weeks. For other tapeworms, treat every 3 months. For Roundworm and Hookworm: Treat at 2,4,8 and 12 weeks of age - thereafter every 3 months. For whipworms: Treat 6 to 8 weeks after 3 months of age.